One thing that always strikes me when I come back to India after having spent some time away is the noise. Europe was eerily quiet… especially on Sundays. The traffic noise I hear outside my window is a symphony of honks, horns and the general hullabaloo of Indian street life. 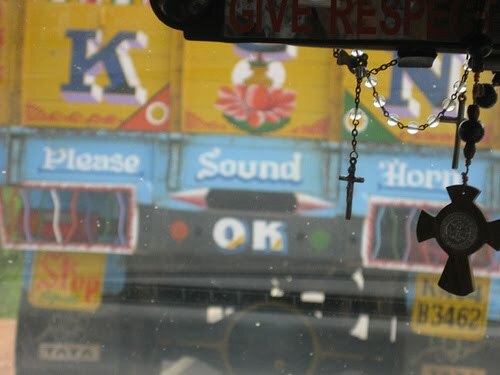 ‘Horn OK Please’ is the mantra of Indian roads. This is painted on the back of trucks, inducing other motorists to make as much noise as possible. 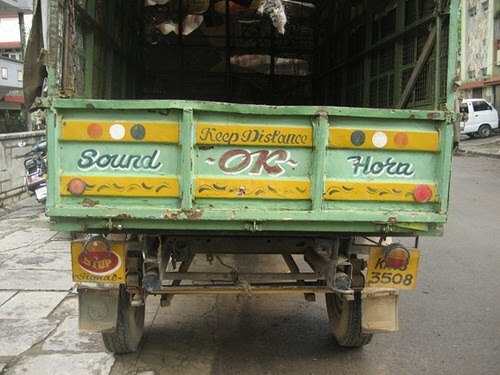 In South India, it’s ‘Please Sound Horn’ or ‘Sound OK Horn’. Each of the different vehicles on the road plays its own part in this intricate symphony of traffic noise. The auto rickshaws provide a constant drone to the soundtrack of the city’s roads with the sputtering of their four-stroke engines. In contrast, motorcycles purr merrily along before screeching to a sudden halt. Scooters contribute an annoying, loud beeping sound when turning corners. The honk of the city buses sounds like a deep baritone, while trucks’ horns have a booming, authoritative blare. The ring-ring of bells on bicycles is more like music to the ears. Included in this cacophonous medley are the musical tunes which are set off when a car is in reverse. This must be an Indian invention. I’ve only seen (or heard, rather) this in India. I understand the concept of alerting others that you are about to reverse but these jingles are more than irritating. I do not appreciate hearing ‘Twinkle, twinkle, little star’ after midnight as a neighbour reverses into a parking spot. Another neighbour has ‘Jaya ho’ from the Slumdog Millionaire soundtrack set as his ‘reversal tune’. It’s been a long time that I put up a new sound on this blog so this evening I went out to the main road with my recorder and recorded the city’s traffic symphony. Listen to this by clicking here or on ‘traffic noise’ under ‘Listen to the sounds of India’ in the right side bar. Sit back and turn the volume WAY UP! I have just come back from South India and I had the opportunity to drive whilst I was over there. To begin with, I was very British in my not sounding my horn at anyone but after a few tries (with trepidation I might add), I was hooting along with the best of them! I digg this entry, India brings a lot of noise and its very difficult to picture it, thanks for the traffic noise sound brings back memories to me! I love India,but what I miss the least is the noise and the horsn, teh decibel is incredible! peace. 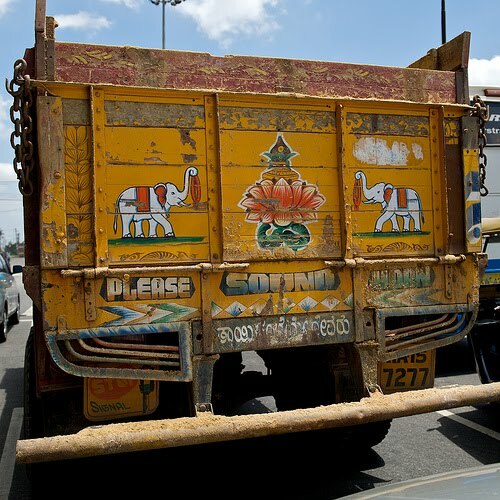 Great post and audio clip, brough back happy memories of my time in India. Sign-boards and Vehicle Signs are gems in the sub-continent! Ah, the memories are flooding back! I love the bicycle bell. Thanks for that little sample of India. Ya nice post! reading this my memories are brought back again, Once when we went a Goddess Durga Temple, while performing the Durga puja by chanting durga mantra, we were disturbed by the vehicles horn sounds which were coming from beside as the temple is situated at a place where there is more traffic junction. I hope noise pollution should come down.